Water managers typically flush Keechelus Reservoir, 100 kilometers (62 miles) east of Seattle, in the winter to make room for melting snow. With almost no snow this year, managers are getting a glimpse of conditions that climate scientists say will be normal by mid-century. Click image to enlarge. SEATTLE, Washington — Famously overcast and stormy in the cold months, the Pacific Northwest is normally a haven for snow lovers. From volcanic peaks to valley basins, winter resounds with the glee of cherry-cheeked skiers and the terror of thunderous avalanches. Mount Baker, a mainstay of the Washington state ski circuit, is accustomed to skyscraping snow accumulations deep enough to entomb an 18-meter (60-foot) building. Not this year. Record-warm temperatures expose bare mountain ridges and disappoint ski bums and lift operators alike. Despite average levels of precipitation, rain is falling, not snow. Snowpack in much of the Olympics, the remote Washington peninsula mountain range, and in the Cascades, the spine from here to northern California, is less than 30 percent of normal. It is a worrisome development, say hydrologists. Snowpack acts as a natural reservoir, a bank of moisture that melts slowly and keeps rivers flowing through the heat of the August dry season when spawning salmon, big wheat fields, and apple orchards are most in need of water. Yet, snowpack in the Pacific Northwest is endangered. If mankind continues putting carbon into the atmosphere at current rates, the extraordinary warm winter of 2014-15 will resemble average conditions in the Cascades and Olympics by mid-century, according to projections from the Climate Impacts Group at the University of Washington. Snowless conditions in the Cascades this winter are a cautionary signal for the entire American West, which is undergoing a “major hydrological shift” from snow to rain because of higher temperatures, according to a paper from University of Idaho researchers published last July. Their analysis projects that the area in which temperatures are cold enough for snow in the 11 western states will decrease by roughly 30 percent by mid-century. Such a substantial decline in snowpack not only vexes skiers. The loss of snow coupled with melting glaciers poses a formidable test for water managers in this region of dams, irrigated fields, and salmon runs that is home to Seattle, the fastest-growing metropolitan area in the nation. Water managers need to balance a constellation of competing interests, from hydropower generation and flood protection, to fish health, forest fire risks, and water supply to cities and farms. The old playbook for operating dams and reservoirs must be revised and adapted to the new hydrology, managers say. To do so, they argue, local, state, and federal governments must continue a recent trend of investing in stream gauges and equipment that monitors river flows, snow levels, and weather patterns. These tools are the guide ropes that managers use to allocate water and prepare for droughts and floods. Though its winters are legendary — Mount Baker Ski Area holds the world record for annual snowfall, at 29 meters (95 feet) during the astounding 1998-99 season — they are also fragile because the region has “warm” snow, said Kathie Dello, associate director of the Oregon Climate Change Research Institute. By this Dello means that snow storms occur in the Pacific Northwest at relatively warm temperatures. At mid-elevations of 1,220 meters to 1,829 meters (4,000 feet to 6,000 feet) above sea level, flakes often form just a few degrees below freezing. Peaks in the Olympics and Cascades rarely rise above 2,743 meters (9,000 feet). 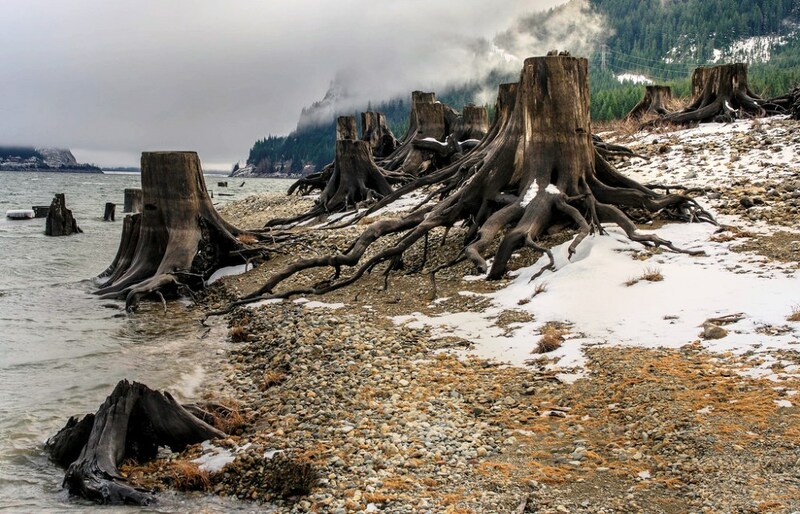 The mild waters of the nearby Pacific Ocean function like a blanket, ensuring that the Cascades do not plunge into hypothermic ranges — the sub-30 degree Fahrenheit days that are more common in the continental interior. This year, because of a ridge of high pressure in the North Pacific, the warm waters are especially pronounced, a phenomenon that the Washington state climatologist has termed “The Blob” and is the main driver of the record heat. Temperatures in Washington are between 2 degrees and 6 degrees Fahrenheit above normal this winter. 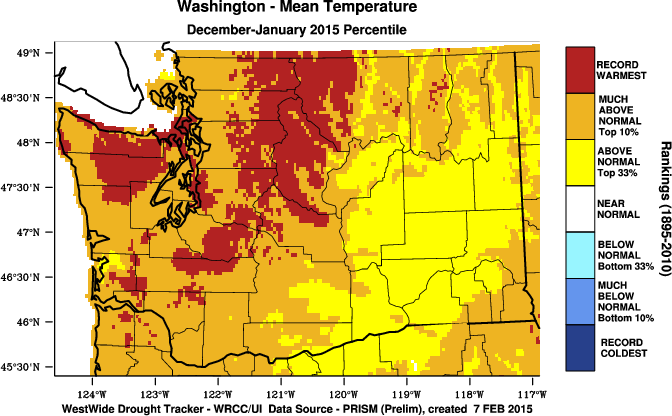 The Cascades have taken the brunt of the heat, seeing record highs in December and January. Click image to enlarge. This year average temperatures in Washington are 2 to 6 degrees Fahrenheit above the 1980 to 2010 average, with the mountains taking the brunt of the heat. The Olympics and Cascades marked record-high temperatures for December and January. Snowpack is correspondingly skimpy — 18 percent of normal in the Lower Columbia Basin of the Cascades and just 7 percent of normal in the Olympics, two of the worst affected basins. Proximity to the Pacific results in ample precipitation, but it also means that the Pacific Northwest mountain ranges are more sensitive to temperature changes than the taller Rockies or Sierra Nevada mountains. Just a few degrees of warming can tip the balance. That knife-edge between snow and rain in the Cascades is cutting in the wrong direction this winter. Its warmth mirrors what climate scientists expect to see in an average year within three decades. Compared with colder parts of the American West, the Pacific Northwest will become increasingly snowfree. By mid-century the number of snow days in the Cascades will drop in half (compared with a 10 percent to 20 percent decline in the Colorado Rockies) while below-normal snow years will occur nearly every year, according to a University of Idaho study published in January. The Climate Impacts Group has run the projections for Washington state. Average April 1 snowpack in the 2040s is expected to decrease between 38 percent and 46 percent compared to the 20th century average. In the same time frame, average annual temperatures could rise between 2 degrees Fahrenheit and 8.5 degrees Fahrenheit, depending on the amount of carbon dioxide in the atmosphere. Earth is currently on a path toward the higher end. The changes in hydrology will have a domino effect. More winter rain results in more winter flooding, which can destroy property and damage fish habitat. Heavy precipitation can also destabilize logged slopes. Intense rainfall played a role in the deadly Oso, Washington landslide in March 2015 that killed 43 people. Less snowpack means earlier spring runoff and warm, stagnant rivers in late summer, which can be deadly to fish. Water managers will need to prepare for a future unlike the past. Some have already started. Paul Fleming is the manager of the climate and sustainability group at Seattle Public Utilities, which provides drinking water to 1.3 million people in the region’s economic hub, and is one of the most forward-thinking utilities in the nation regarding climate change. Fleming compares conditions this year to 2005, the region’s last dry year. At the time, Seattle Public Utilities was “just scraping by” to refill its reservoirs before the summer dry season, Fleming told Circle of Blue. The familiar management playbook was not working. Without an adequate snowpack, operators must hold more water in reservoirs in the winter so that supplies are available for cities, farmers, and fish later in the year. But the move to fill reservoirs in the winter also increases the chance of flooding if a big storm arrives. These actions mean that operators must go against the standard guidelines — known as rule curves — for operating a reservoir. Rule curves take into account historical precedent and how much water should be in storage at a given point in time. Fleming said that the experience in 2005 led Seattle Public Utilities to tweak its reservoir operating procedures, which are now more dynamic and respond to changes in rain and snow in real time. If the old rule curve formula resembled a military drum line marching in lockstep, the new methods are more like jazz, fluid and shifting. Reservoir operators at the Bureau of Reclamation, the federal agency that manages dams and irrigation projects in the West, came to the same conclusion. On-the-ground data is the lifeblood of hydrological forecasting. Computer models that predict conditions up to a year in advance need to be calibrated and refined by comparing the model’s output with historical measurements. The region’s river forecast centers use stream flow information from U.S. Geological Survey monitoring networks and snow measurements from National Resources Conservation Service sites. Snowpack in most of the Cascades and Olympics is significantly below normal for mid-February. Click image to enlarge. Both Seattle Public Utilities and the Bureau of Reclamation use forecasts from the Northwest River Forecast Center, one of 13 regional forecasting divisions of the National Weather Service. Yet even as the complexity of river forecasting increases, and hydrological cycles are more disrupted than ever before, the nation’s resolve to pay for data collection and analysis is in transition. Two years ago, at the height of Congress’s drive for fiscal austerity, some 618 stream gauges were shut down by the U.S. Geological Survey and its local partners for lack of money. Federal dollars used to support half the cost of operating a jointly-funded stream gauge. Now, the federal share is down to 30 percent. National Water and Climate Center officials told Circle of Blue last year that they deferred maintenance of many snow-monitoring sites after a 15 percent budget cut in 2011 and a 7 percent retraction during sequestration in 2013. Recently, though, Congress increased funding for the National Streamflow Information Program, which goes toward stream gauges, by $US 6 million in 2014 and $US 1.2 million in 2015, a 26 percent increase over two years. It was enough money to provide full support for 1,000 of the 8,100 monitoring sites in the national streamflow program. The remaining sites are paid for by state and local agencies. Still, there is room for improvement. The Cooperative Water Program’s budget — $US 59 million — has remained roughly the same for 25 years, cutting the real value of its funding in half because of inflation. More of the 4,759 gauges deemed a national priority could be supported by a full appropriation from Congress, and the federal cost-share for collaborative projects could be increased. Rather than worry about the impact that anthropogenic carbon “release” may or may not have on the weather how about we discuss the high crimes committed against mother nature in the form of GMO crops, weather modification experimentation also known as “geo-engineering” and the fact that the largest “carbon offenders” are simply allowed to operate outside the standards and carbon limitations that they themselves pushed for to begin with by relocating their operations into parts of the world that will never have a single carbon limiting statute, ordinance or policy. You should also include maps of Oregon… the Pacific Northwest is not just Washington. The focus on the NW “warm weather”, vice the NE “cold weather” is a pathetic tell on how you interpret news to support pseudo-data. There is enough real weather data to support general behavioral shifts, without the need to politically push perceptions based on “edited” numbers, headlines (clicks) and “Brothers Grimm” stories like this one. If there was one real take-away, it would be that the national investment in a project that connects water supplies from the NW to the SW US, like the electrical magic that has the NW supplying LA with electricity through high voltage lines originating from Bonneville (OR), to balance out the Western US grid….the investment involved with shifting water from NW to SW would certainly be worth it (based on everything the Chinese have done)….and yet, with oil getting cheaper and deflation gaining ground…..why care? That race has been run. Fox News told me Im a gay muslim communist if I believe in Al Gore’s globul warming. Also, Benghazi.